The beloved novel, Little Women, was written and set in the Orchard House (c. 1690), the home of Louisa May Alcott and her family located in Concord, Massachusetts. Since its 1912 grand opening, vibrant and inspiring educational experiences have been offered to millions of people from around the world in one of the nation’s most authentically preserved historic house museums. Here, visitors not only feel as if they are “walking through the pages of Little Women,” but they discover the Alcotts’ commitment to family, social justice, education, and the arts, as well as their friendships with such 19th-century notables as Ralph Waldo Emerson, Margaret Fuller, Henry David Thoreau, Nathaniel Hawthorne, and Elizabeth Peabody. Today it is acknowledged that exercise, health and self-esteem go hand-in-hand, but folks in the 1800’s didn’t think so. Over 150 years ago, the innovative Alcott family in Concord not only thought it, but boldly flew in the face of contemporaries who believed exercise would harm young ladies. On September 11, 2016, participants of the 11th Annual Alcott Benefit Walk/Run can continue their tradition of engaging in physical fitness. We are so pleased that the Alcott’s progressive belief in the vital importance of exercise captured Uta’s heart. “The Alcotts were ahead of their time in so many ways,” said Uta. “It was quite unusual in that era to view physical activity as having a positive effect on your overall health. I was so excited to learn that Louisa May Alcott herself loved to run and walk long distances ever since she was a child. I am delighted to be Honorary Chair of the Louisa May Alcott’s Orchard House 5K Walk/5K and 10K Run this year again.” Proceeds will benefit the educational programming and historic preservation Orchard House has conducted for a century. 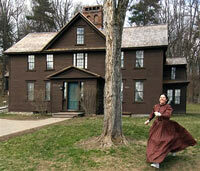 For more information, please visit www.louisamayalcott.org. The Alcotts’ progressive belief in the vital importance of exercise recently captured Uta’s attention. Uta says, “The Alcotts were ahead of their time in many ways; it was quite unusual in that era to think of physical activity being health promoting for women. I was so pleased to learn that Louisa May Alcott herself loved to run and walk long distances ever since she was a child. I am delighted to be Honorary Chair of the Louisa May Alcott 5K Walk/10K Run again.” Proceeds from the event will help to fund educational programs and historic preservation at Orchard House. And congratulations to The Alcott House for having Little Women chosen as the Massachusetts featured book at the Library of Congress Book Fair in Washington, D.C. September 2008! With all manner of athletes involved—from serious marathoners to “strollercisers,” the Second Annual Alcott Walk/Run was a huge success, once again topping the $10,000 mark. Not only does the money raised go to preserving Louisa May Alcott’s beloved home, but also to educational programs to help children. Nearly 250 Walk/Run participants aged 6 to 76 years joined area businesses in generating over $10,000 in the first Alcott Walk/Run on October 22, 2006. All proceeds from the Walk/Run fundraiser are used for educational programming and historic preservation. © Copyright 2011-2018 by Take The Magic Step®. All Rights Reserved.